Just becaue your ear piercings (should you have them) are permanent, doesn't mean earring trends are too. In fact, we reached out to three top jewelry designers to get the inside scoop on which ear piercings will be in and out for 2017. Whether you forgot you even have your ears pierced at all, or are someone who wears the same pair of studs every single day, let this be a lesson. Despite aligning opinions from designers Paige Novick, Candice Pool Neistat from Finn, and Baylee Swart from Azlee that the overwhelming multiple ear piercings look will be "out" in 2017, they each have a unique take on the trends that will be "in," and let us tell you, each is just as sleek as the rest. So get ready to shop the ear piercings that will be in and out this coming year and be prepared to put a few of the following trends on the back burner for the time being! Keep reading to shop the earring trends that are going to blow up in 2017. "I think in 2017 we will see a less-is-more approach. Statement earrings are really going to have a moment." "I think piercings that go all the way up the ear will be out in 2017. It will be more about strategic placement of holes (interesting/unusual places), rather than predictably running from top to bottom." Simplicity is key this season. These are't your everyday hoops. "Earring trends in 2017 will be all about individuality and wearing what you absolutely adore! While multiple ear piercings are not going away anytime soon, I feel that more aggressive piercings, as in nose and septum rings, may be on the decline. 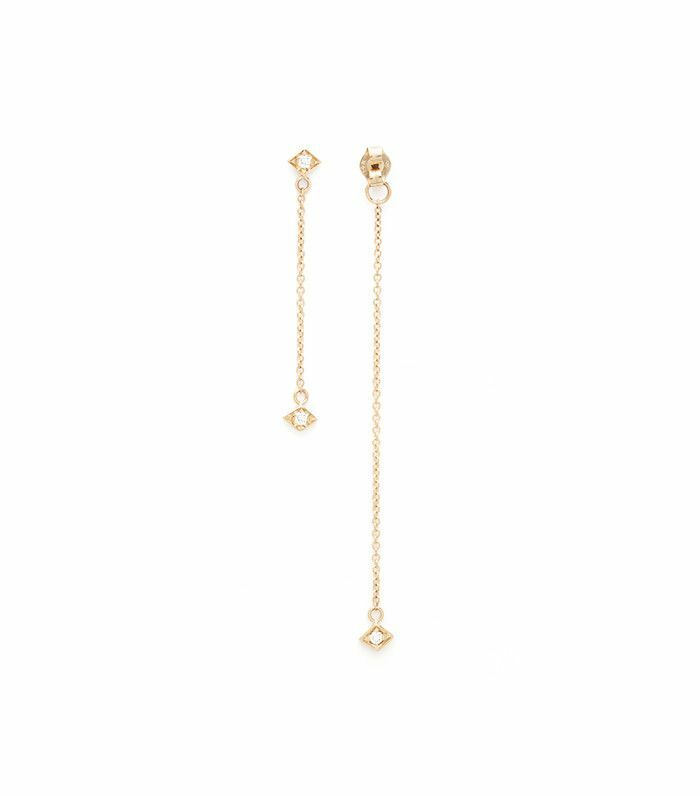 As RTW becomes more and more about volume, we will see this reflected in the proportions of bold single statement earrings that feel modern, chic, and glamourous." We see this paired with an elegant one-shoulder dress. "The messy ear is over. That doesn't mean you have to ignore your extra piercings, you earned those! But clean studs, simple huggies, and symmetry are the best ways to keep it edgy yet understated." Add some subdued sparkle to your look. Keep an eye out for this new jewelry designer. The prettiest blue you ever did see. The chic way to be lopsided. No one would ever be able to guess the affordable price of these. Wear these every day and be beyond happy. Talk about a statement earring. Sometimes one stud is better than two. Add some edge to your ensemble with these earrings. Leave it to Vetements to design the coolest earring ever. The missing pieces to your jewelry collection. Architecture and fashion happily marry in this earring set. Which of these trends are you most likely to try? Let us know in the comments below!